I'm at my wits end. 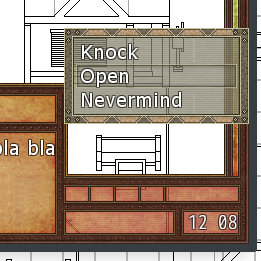 Basically all I want to do is change the choice window to either match the transparency of the text box, or erase it all together. As you can see in my screenshot it's using the windowskin (which it should) but I don't want it to. I'm pretty much on my hands and knees here, anyone have any idea how to fix this? I've checked almost every inch of google search and just about every vx ace forum I can find to no avail. you want it to be transparent? Yup, and at the moment just these. As far as I can tell I can't fix it with Yanfly's message system. is the choice window modified at all? You're an absolute life saver! It works perfectly. I can't thank you enough, I was getting so frustrated! And thank you for being so quick! I was expecting a lengthy wait at least, can't express my levels of gratitude haha.